Get a repair manual! Use This Link -It helps support this site! You can make a donation to help keep things running HERE Thank You! Dedicated to the Suzuki GS500 / GS500E / GS500F and its owners.ï¿½ This is a place where owners can get ideas, information and share experiences.ï¿½ Our mission is to enhance the GS500 ownership experience by providing a one stop resource. 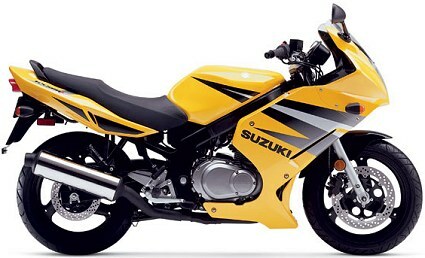 Suzuki's GS500F a big hit in the United States! Based on Suzuki's successful GS500, the Suzuki GS500F blends all the reliability and performance of the original machine with a sporty new look. *Ordering a repair manual through our Amazon.com link helps keep this site up and running! 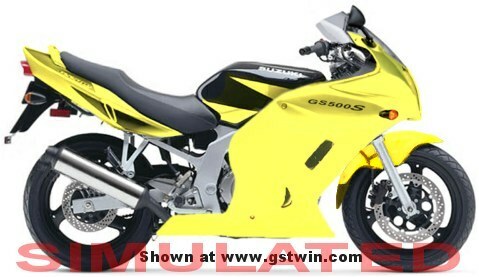 This site is made out of love for the GS500 -that loveable little twin that has been around for over 16 years. Rarely does a model continue virtually unchanged like the GS500. GStwin.com hits its 5 year anniversary in February and is increasing in popularity every month. The feedback has been so positive, so many people have said so many nice things, and some have donated money to ensure GStwin will continue to grow and offer even more to GS owners year after year. So much has changed since the site started out as Annie's GStwin site on Yahoo/Geocities free pages back in early 2000. As traffic grew we knew the GS500 needed a proper site to do it justice, so within the first year we moved here to GStwin.com. It has been so much fun and we have met so many great people since we moved here and hope to continue to provide the best GS500 site available. We thank you for your support through our Amazon.com links. So far we have generated enough money through Amazon.com and donations to pay for the web space and extra bandwidth necessary to keep GStwin.com going. This is great as we originally thought we would have to have those annoying popup banners on the site. We hope you enjoy using the site and stop by often. Millions of Loyal GS500 owners have stopped by since April 2000 -wow! What do you think? What would you like to see? Please let us know!